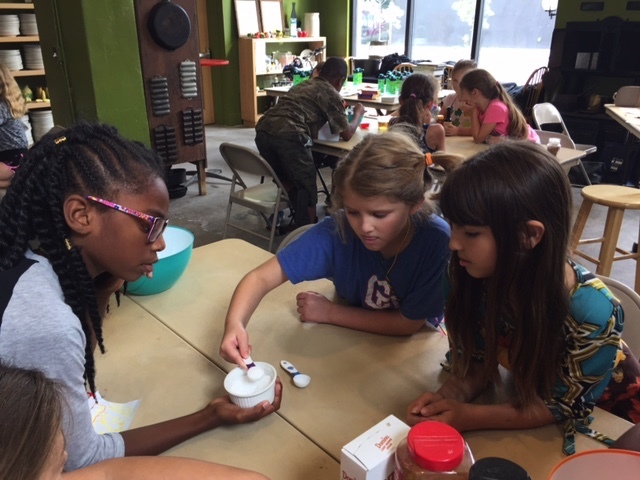 SoFAB Kids Culinary Camp is a week-long, half day camp dedicated to teaching nutritional literacy through food preparation, nutrition activities, food history, games, and, the best part, eating! Camp runs from 9 AM to 12 PM. Admission is $130 per week, $100 for members. For multiple week registrations, it will be $110 for non-members, and $90 for members. SoFAB's Director of Education, Jennie Merrill, runs the camp and keeps everyone focused and having fun. Please contact her with any questions about camp activities, enrollment, or museum information. Jennie is supported by a team of interns from local and out-of-state colleges. Learn more about camp in years past through our blog posts here. Tickets will be sold here through Active.com. If you've used Active before, you should have an account that you can log in to. Please do not register children for whom you are not a parent or guardian because we ask for parents to sign liability waivers. If you are not a SoFAB Member and you purchase the member ticket, you will lose your spot as we will have to re-register at the regular rate. 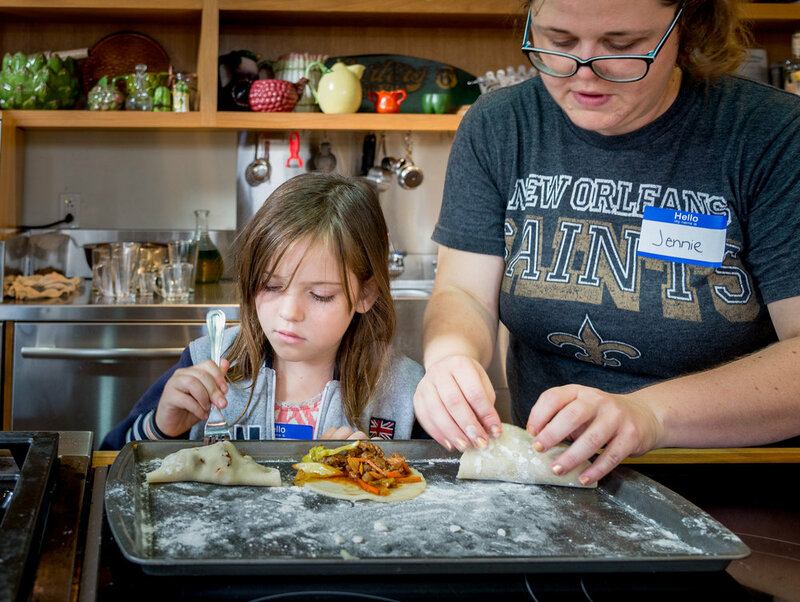 If you are unsure if you're a member, please contact Kelsey Parris (kelsey@southernfood.org or 504-267-7490). If you have any issues with registering, please call us at 504-267-7490. Tickets may be refunded or exchanged up to 72 hours prior to the event. After 72 hours no refunds will be available. Please note: there are 4 types of tickets you can buy: Nonmember- $130; Member- $100; Nonmember Multiple Week- $110; Member Multiple Week- $90. Multiple week tickets are an incentive for registration. It does not include multiple children in a family attending, only multiple weeks that one child is attending. If your child attends one week of camp and wants to attend again, if available you can purchase a multiple week ticket for another week of camp. The multiple week discount cannot be retroactively applied to your original ticket. If you register your child for multiple weeks of camp, and your child is unable to attend the 2nd session of camp, a refund will be given with the ticket difference taken from the second registration. Student/Industry memberships are ineligible for camp discounts. Discount Tickets- SoFAB Staff will be checking every Friday to make sure all discount sales are accurate. If you have purchased discount tickets with the wrong membership, no membership, or purchased a multiple week ticket and haven't signed up for multiple weeks I will give you a call to figure out what happened. Up until June 6th, you will have 3 days to correct your purchase, after June 6th you will have 24 hours. If payment inaccuracies have been discovered and not fixed 3 business days before camp, you will receive a 50% refund and your spot will be forfeited. If there is a failure to provide the accurate payment, your spot will be forfeited. You are ineligible for multiple week discount tickets if you are only registered for one week, and your second week you are waitlisted. If you are moved off the waitlist, your second registration will be the multiple week discount and no discount will be applied retroactively to your original ticket. Memberships must be under the name of the ticket purchaser or listed family, you cannot use another family's membership to purchase discounted tickets. Refunds- Full refunds: Up to 2 weeks before your camp week. 50% refund: Up to the Wednesday before your camp week. No refund: Thursday before your camp week and on. This includes cancellation for any reason. Waitlist- Your ticket will say waitlist and we will call you as soon as, or if, we have an opening. It is possible it could be up to the day before. While no money is needed at check out if you are waitlisted, you must be paid in full before your child comes to camp on Monday. Waitlist is in order of the timestamp and you cannot jump spots unless the person in front of you forfeits theirs. Age Restrictions- If we discover during camp that your child is not the age listed on their registration, and therefore ineligible for their camp session, you will be called immediately to pick up your child and you will not be given a refund for the remainder of the week. Switching Tickets- If your child ends up making State last minute, first of all congrats, but we do not allow you to pass on your tickets to a friend or loved one unless there is no waitlist. We have had a waitlist for every week of camp for the past 2 years and it would be unfair to have you skip in line, plus we need their personal information and liability forms signed before they can attend. Registering A Child That Isn't Yours- The big thing is I need to make sure those waivers are signed by whoever is ultimately responsible for that child. If it isn't you, go ahead and give the responsible party your Active log-in information to complete that part of the form. These policies are created to the best of our abilities to protect our organization, your child, and other children. We reserve the right to modify these policies at any time. Please feel free to email me at jennie@southernfood.org with questions before purchasing. The museum number is 504.569.0405.